Cando Rail Services Ltd was the provider to turn to when Canadian Pacific looked for ways to improve speed and efficiency at its massive intermodal railyard outside of Toronto. Since 2007, Cando has played an increasingly important role supporting CP at its Vaughan Intermodal Terminal. Cando’s yard crews handle key tasks that have allowed CP to increase its network velocity and build capacity all the while maintaining safe operations. Cando works with CP to assemble a number of trains including the Vancouver-bound 101 train which runs every evening. CP’s 101 is one of the most important daily trains in North America, serving as a vital economic link from east to west in Canada. It takes just four days for CP to get the 101 from Toronto to Vancouver, which is faster than any other railway. One of the main reasons it’s so efficient is because of how Cando gets it started. Cando has about 90 minutes each evening to get the 2.5 mile long 101 ready for its long crosscountry haul to the Pacific coast. With daily direction from CP, Cando’s crews assemble the cars and connect the locomotives at the front, middle and rear of the train. Cando is able to get the job done reliably and without incident because of the experience and expertise of its team at Vaughan. THE WORK THAT CANDO DOES AT CP’S VAUGHAN INTERMODAL TERMINAL IS AN EXAMPLE OF HOW MUCH THE COMPANY HAS GROWN AND ACHIEVED OVER THE YEARS. Founded in 1978, Cando provides innovative railway support services to a wide range of blue chip industrial and transportation companies in North America. It is now the preferred service provider at more than 18 fixed industrial sites across Canada and the United States. It operates three short line railways and has earned an excellent working relationship with Class 1 railways. Cando is on a mission to deliver industry leading railway services and to become North America’s leading railway services provider. A million tiny details come together in Vaughan, Ontario to ensure the Canadian Pacific 101 train is on its way to Calgary and Vancouver by 9 p.m. every day. It’s a mammoth operation ensuring one of North America’s most important daily freight trains is put together and rolling down the track. Work on the 101 at Vaughan is divided between Cando’s yard crews and CP’s road crews. Every minute counts. Shippers wanting to get their goods on to the 101 need to have their trucks in the Vaughan yard by 7 p.m. Cando’s experienced railway workers go to work on the 101 each evening at 7:30. They have only 90 minutes to build the 101, robotize the locomotives and get it all ready for departure at 9 p.m.
Cando has a 100 per cent record in meeting that daily deadline. Just as impressive is Cando’s safety record: the company has gone more than six years without a lost time injury and more than three years without an incident. Transport Canada rules stipulate that road crews are allowed to be on the job for only 12 hours at a time. By using Cando, CP’s road crews can focus on getting the 101 quickly and safely across the country. The railway business is among the most competitive in North America. Class 1 operators such as Canadian Pacific are constantly looking to increase network velocity, build capacity and enhance their ability to operate safely. In some cases, the best way to do that is to engage a service provider like Cando to be responsible for one or more aspects of the operation. With Cando providing experienced yard crews for CP at Vaughan, the railway gains flexibility to manage other aspects of its operations. 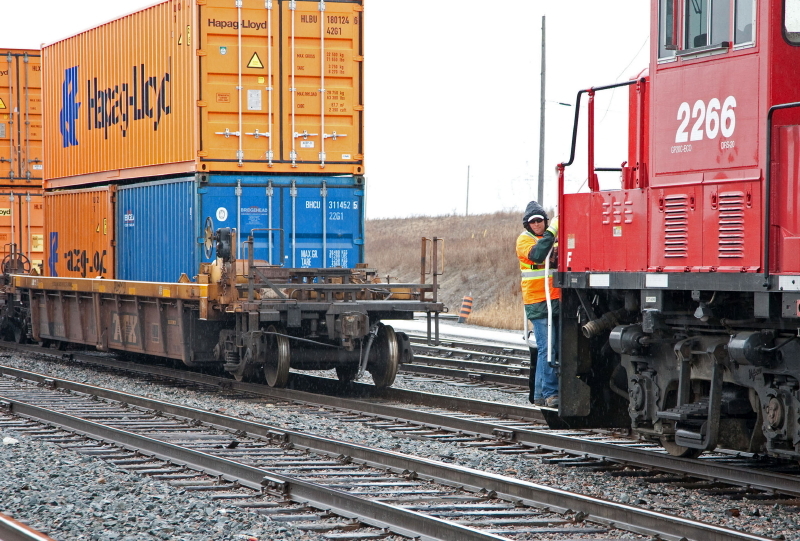 Cando Rail Services won its first contract from CP’s Vaughan Intermodal Terminal in 2007. Its role has been expanding ever since as its crews have demonstrated their ability to deliver speed and efficiency to CP reliably. The terminal has seen many changes over the years to adapt to industry and economic needs. Trains have grown bigger. More track has been laid. Schedules have changed. The need for distributed power has grown. Cando is an industry leader in providing railway support services to industry and Class 1 railways. Cando is an employee-owned company and was established in 1978 in Brandon, Manitoba. It has since grown to offer a sophisticated array of services across North America. For more information about how Cando can help your company with its logistics and rail operations, please contact us.